As I might have mentioned before Mary Berry is a bit of an idol of mine. Her book was my first baking book and is still my first go to point. Christmas eve is my mum's birthday and for the last few years we've had pancakes for breakfast. The deep fluffy kind, Scotch or American rather than thin crepe type pancakes. 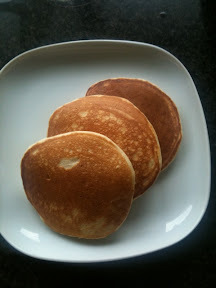 One of my favourite recipes is Mary Berry's Scotch Pancakes which we had this morning. I had mine with apple butter, my mum had orange syrup (a simple sugar syrup with fresh orange juice squeezed in) or they're also yummy with maple syrup and berries. Start by putting the flour, baking powder and caster sugar in a large mixing bowl. Make a well in the middle and add the egg and about half of the milk. Use an electric whisk to gradually incorporate the dry ingredients. Once mixed together add as much of the rest of the milk as you need to make a thick smooth batter. Heat a non-stick frying pan up and grease with a little large or flavourless oil. Carefully place 1 heaped desert spoon in the pan and smooth out slightly to form the pancakes. Once the top starts to set and bubble turn the pancake over to cook the other side. Serve hot with your chosen topping. If you have any mixture left over save it in the fridge for the next day or make extra pancakes and freeze them. Recipe from Mary Berry's Ultimate Cake Bible.